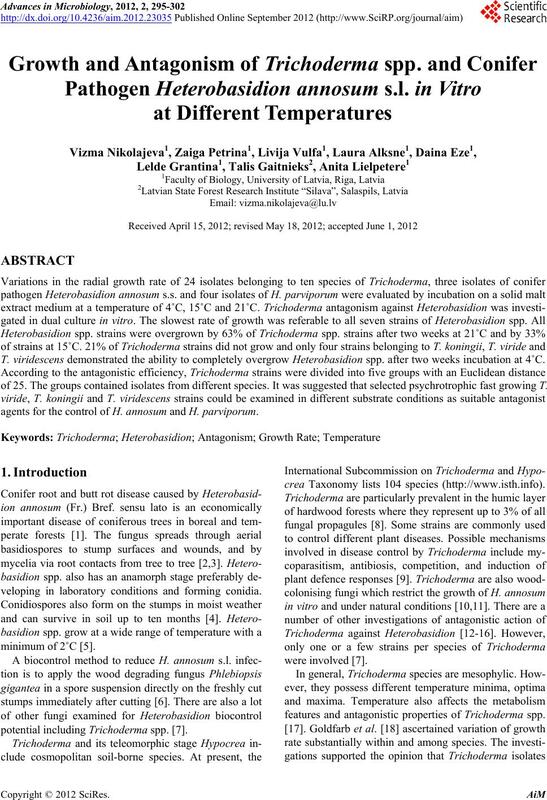 T. viridescens demonstrated the ability to completely overgrow Heterobasidion spp. after two weeks incubation at 4˚C. of 25. The groups contained isolates from different species. 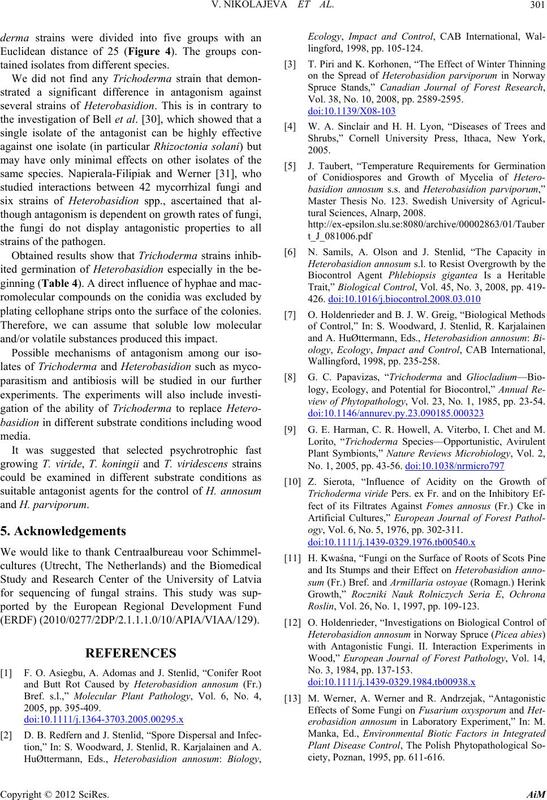 It was suggested that selected psychrotrophic fast growing T.
agents for the control of H. annos u m and H. par vip oru m.
veloping in laboratory conditions and forming conidia. potential including Trichoderma spp. .
crea Taxonomy lists 104 species (http://www.isth.info). 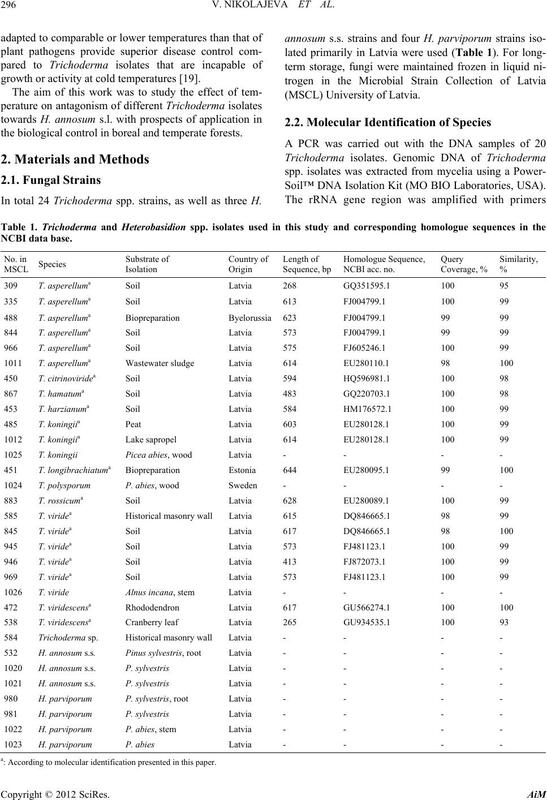 features and antagonistic properties of Trichoderma spp. growth or activity at cold temperatures . the biological control in boreal and temperate forests. In total 24 Trichoderma spp. strains, as well as three H.
Soil™ DNA Isolation Kit (MO BIO Laboratories, USA). cording to molecular identification presented in this paper. Mastercycler Personal were carried out in 25 μl volume. 1011 - 1012 was done in CBS, Utrecht, the Netherlands. 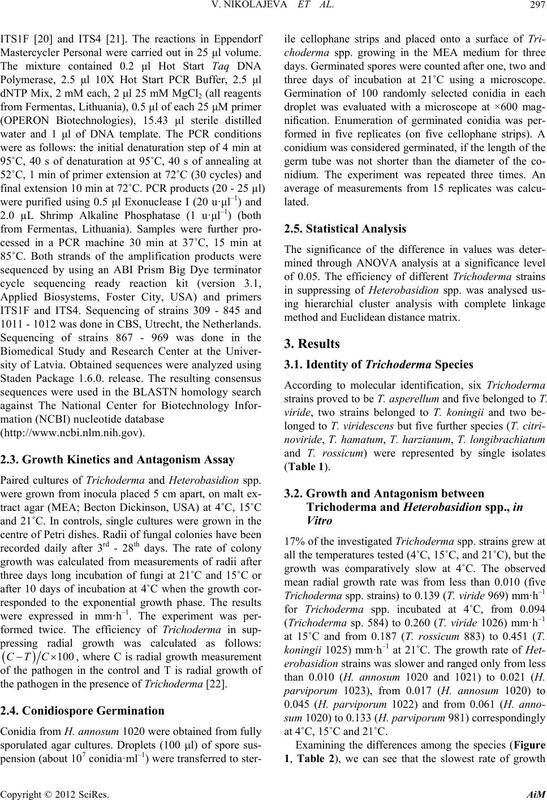 Paired cultures of Trichoderma and Heterobasidion spp. the pathogen in the presence of Trichoderma . three days of incubation at 21˚C using a microscope. method and Euclidean distance matrix. strains proved to be T. asperellum and five belonged to T.
at 15˚C and from 0.187 (T. rossicum 883) to 0.451 (T.
than 0.010 (H. annosum 1020 and 1021) to 0.021 (H.
at 4˚C, 15˚C and 21˚C. numbers are shown in Table 1. Data are presented as means for each variant. Error bars indicate SD. Table 2. 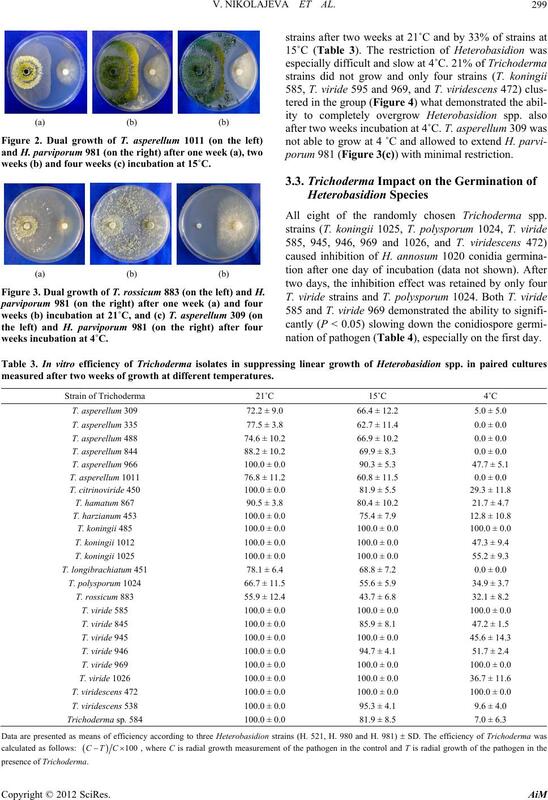 Radial growth rate of colonies of Trichoderma and Heterobasidion species on MEA at different temperatures. the same column with different superscripts are significantly (P < 0.05) different. T. asperellum 1011 and H. parviporum 981 (Figure 2). efficiency of Trichoderma) by 63% of Trichoderma spp. weeks (b) and four weeks (c) incubation at 15˚C. Figure 3. Dual growth of T. rossicum 883 (on the left) and H.
porum 981 (Figure 3(c)) with minimal restriction. All eight of the randomly chosen Trichoderma spp. nation of pathogen (Ta ble 4), especially on the first day. measured after two weeks of growth at different temperatures. tures at a temperature of 21˚C, 15˚C and 4˚C (Table 3). ± SD affected by Trichoderma colonies. 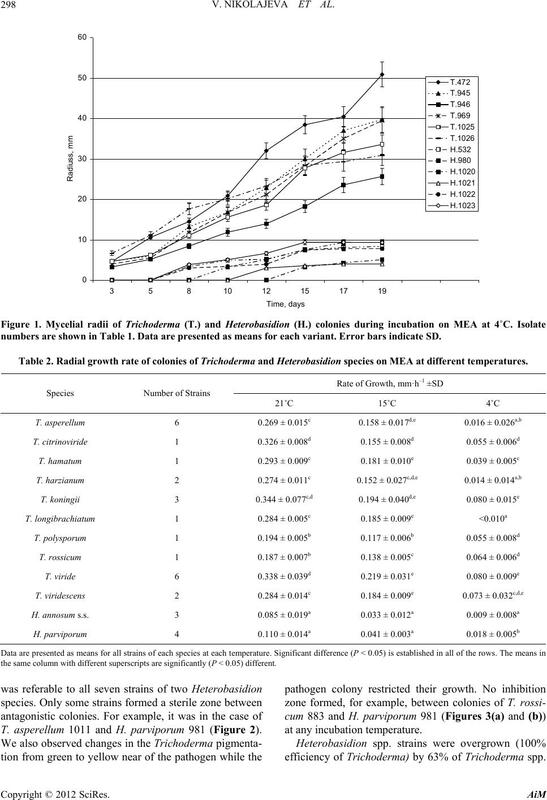 between species only at 4˚C (Table 2). 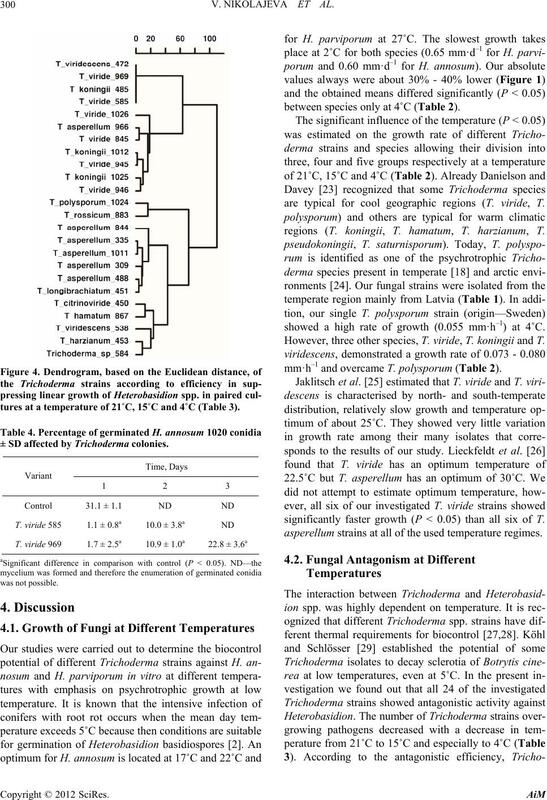 are typical for cool geographic regions (T. viride, T.
regions (T. koningii, T. hamatum, T. harzianum, T.
showed a high rate of growth (0.055 mm·h–1) at 4˚C. However, three other species, T. viride, T. koningii and T.
mm·h–1 and overcame T. polysporum (Table 2). significantly faster growth (P < 0.05) than all six of T.
asperellum strains at all of the used temperature regimes. tained isolates from different species. plating cellophane strips onto the surface of the colonies. and/or volatile substances produced this impact. and H. parvipor um . tion,” In: S. Woodward, J. Stenlid, R. Karjalainen and A.
Vol. 38, No. 10, 2008, pp. 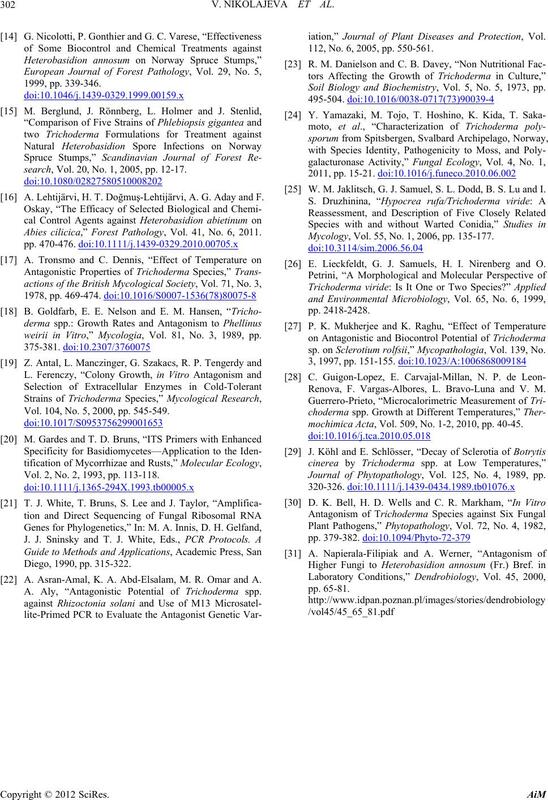 2589-2595.
view of Phytopathology, Vol. 23, No. 1, 1985, pp. 23-54. G. E. Harman, C. R. Howell, A. Viterbo, I. Chet and M.
ogy, Vol. 6, No. 5, 1976, pp. 302-311. Roslin, Vol. 26, No. 1, 1997, pp. 109-123. No. 3, 1984, pp. 137-153.
erobasidion annosum in Laboratory Experiment,” In: M.
ciety, Poznan, 1995, pp. 611-616.
search, Vol. 20, No. 1, 2005, pp. 12-17. A. Lehtijärvi, H. T. Doğmuş-Lehtijärvi, A. G. Aday and F.
Abies cilicica,” Forest Pathology, Vol. 41, No. 6, 2011.
weirii in Vitro,” Mycologia, Vol. 81, No. 3, 1989, pp. Vol. 104, No. 5, 2000, pp. 545-549. Vol. 2, No. 2, 1993, pp. 113-118. A. Asran-Amal, K. A. Abd-Elsalam, M. R. Omar and A. A. Aly, “Antagonistic Potential of Trichoderma spp. iation,” Journal of Plant Diseases and Protection, Vol. 112, No. 6, 2005, pp. 550-561. Soil Biology and Biochemistry, Vol. 5, No. 5, 1973, pp. W. M. Jaklitsch, G. J. Samuel, S. L. Dodd, B. S. Lu and I.
Mycology, Vol. 55, No. 1, 2006, pp. 135-177. E. Lieckfeldt, G. J. Samuels, H. I. Nirenberg and O.
sp. on Sclerotium rolfsii,” Mycopathologia, Vol. 139, No. Renova, F. Vargas-Albores, L. Bravo-Luna and V. M.
mochimica Acta , Vol. 509, No. 1-2, 2010, pp. 40-45. Journal of Phytopathology, Vol. 125, No. 4, 1989, pp.